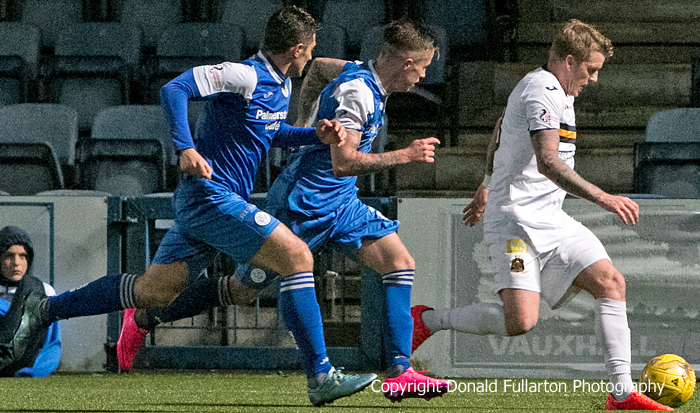 DUMBARTON produced one of their best performances of the season in front of 1,465 people at Palmerston Park, Dumfries, but came away with nothing. James Fowler's full-time Queen of the South side, who were second best throughout, took all three points thanks to a goal from veteran striker Paul Heffernan shortly after half-time. Stevie Aitken's men had reason to feel aggrieved at the end, with good chances in both halves going just wide or being saved by home keeper Robbie Thomson. The closest they came was in the 90th minute, when Kevin Cawley — making a welcome return after a period of injury — fired in a shot which hit the base of the post and bounced out, then former Queens player Willie Gibson saw the keeper just keep out a shot which squirmed through his hands. Manager Aitken said afterwards: "There are a group of very disappointed players in our dressing room. The fact that Queens keeper was the man of the match tells the story." The picture shows two defenders chasing after Willie Gibson.